Go inside Cisco's realtime brainstorming labs to discover how rapid prototyping creates cutting edge solutions for supply chain and blockchain. The Innovation Hangar is well hidden within the historic structures of San Francisco's Palace of Fine Arts. Look a little deeper within the domed scenery and you'll find the hangar—a vast open space with a rounded ceiling and a length that seems to go on and on. Cisco's CHILL (or Cisco Hyperinnovation Living Labs) invited executives, customers, thinkers, and innovators inside the hangar for a whirlwind 48-hour rapid prototyping lab on May 2nd and 3rd to discuss how to secure the digitized supply chain powered by blockchain. Glowing, blinking orbs are strewn across the expanse of the hangar—large lanterns specifically designed by CHILL Senior Innovation Architect Shannon Lucas to physically represent a blockchain. One hanging lantern turns red while the rest glow green. The red orb, representing one node in a blockchain that has been overtaken with malicious intent, begins to blink. The blinking signifies how the rest of the blockchain can detect the hack with transparency, and work to rectify it in real time. With blockchain, trust is distributed. Every participant is a part of the whole that controls the process. Soon, the blinking red lantern turns back into green: the invader has been pushed out. "CHILL is all about doing as a form of learning. By building a prototype, a physical representation of the blockchain itself, we could move the conversation from the theoretical to the tangible. That's why we build over a hundred prototypes over the course of the lab," says Lucas. This is the reality that Cisco and companies like GE, DB Schenker, Citi, and Intel are trying to create—the most innovative concepts for blockchain and supply chain that can transform the industry as a whole. The CHILL process allows key players in this industry—experts, creatives, customers, executives, and most importantly, end users—to have a hand in the rapid prototyping process. The furious speed at which the teams work helps create somewhat of a pressure cooker where the best concepts rise to the top. CHILL is comprised of four main teams: the Concept team, the Build team, Insight team and the Investment Panel. Concept teams are comprised entirely of senior executives who have industry knowledge , budgetary responsibility, and can help drive the solutions they create after a lab. For this specific CHILL experience, Concept teams were split into five opportunity areas: Intelligence at the Edge, Securing the Virtual Supply Chain, Cross Border Transactions, New Ways to Move, and Safe, Certified, and Circular. These five teams come up with the concepts that are then given to the Build team to actualize. Build teams are made up of designers, programmers, and creatives—the dreamers who can help bring the Concept team's concepts to life. The Insight teams are filled with experts from various industries who help answer questions about the larger business world—everything from market to competitor analysis. The catch? Concept and Build teams must present their prototype to fifty end-users every 90 minutes; and if they don't like it, the idea is scrapped and the teams start from scratch. By the end of the first day, the five Concept teams must have at least one prototype they have all agreed on, and Build team works through the night to make the prototypes come to life. It's a hurricane of an experience that culminates with each team making a concept pitch at the end of the second day. These pitches represent the most innovative, user-tested thinking from the best in the industry. Shannon Lucas and CHILL Innovation Architect Manager Alice Pollard designed the hangar's speakers to blast the Star Wars theme song every time the 90-minute ideation period is up. The end users walk out of their set lounge at the cue of the theme to inspect any new ideas, a mark that teams recognize as the possible beginning or end to a prototype. The end user group is constructed from players across field and company—a vice president from one company may be working hand-in-hand with a factory floor foreman from another. A poster that hangs on the outside of the end users' lounge reads "Killed any darlings lately? "A poster that hangs on the outside of the end users' lounge reads "Killed any darlings lately?" with a tattoo design of a skull and banner that adds, "Set free that which you love". This theme of trial-and-error is crucial to CHILL lead Kate O'Keeffe, who urges that the best ideas come from working, reworking, and reworking once more. Concept teams are formed in pods that create one whole circle, (called the "Arena") while the Build team sits at workstations right in the middle. This physically prepares Concept teams to constantly keep their prototypes and end-users front-of-mind at all times. "Impossible spaces create impossible thinking," says Pollard. The hangar is also outfitted with what the CHILL team refer to as "vignettes", or real life replicas of supply chain locations—a loading dock with packages and a border control room help teams visualize their prototype as well as aid in presenting concepts to end users. To foster out-of-the-box thinking, the entire Innovation Hangar was transformed into a space to let CHILL participants dream big. Supply chain is a crucial field for Cisco and other companies. The total of all the supply chains present at CHILL was half of a trillion dollars. CHILL helps determine the theme for each living lab brainstorm by keeping an ear to Cisco, its customers, and the industry. Cisco found that companies believed blockchain and security in the realm of supply chain could positively impact their business. 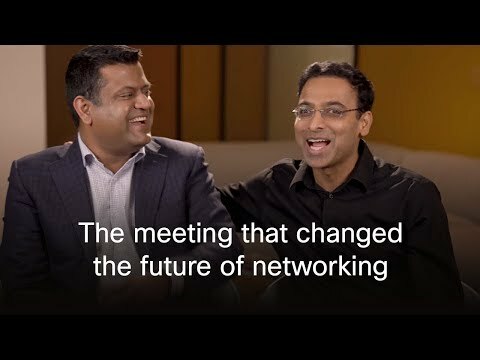 Cisco Innovation Engineering Lead Anoop Nannra states that applying the blockchain to Cisco's massive network of 500 million globally-deployed devices alone could create major disruption and transformation. "This process is all about creating concepts that Cisco and its customers will want to co-invest in," says CHILL Prototyping Lead Justin Muller. The process of collaboration between companies can aid in improving supply chain as a whole. Citi Ventures Managing Director and Global Head of Innovation and Strategic Partnerships, Niki Manby notes that because all of the companies involved in the prototyping lab play important roles in supply chains, bringing them together through CHILL can help them learn even more. "CHILL provides a collaborative environment for our companies to explore and learn together," says Manby, "We uncover paths to new commercial solutions that could only come by working with other leading companies in the ecosystem such as Cisco." Citi Ventures Director Ian Lee who heads Citi's Global Lab Network and leads Citi's Blockchain Accelerator says "CHILL helps us explore emerging opportunities and applications of blockchain technology through collaborative innovation ecosystems." Manby and Lee were also joined by several Citi colleagues from Citi's Treasury and Trade Solutions (TTS), Markets, and Corporate Investment Bank businesses, including Shreyas Chipalkatty, EMEA Head of Shipping and Logistics for Citi's Corporate Investment Bank, who says he has two outcomes he's looking for most from CHILL—the learning journey and the experience with co-creation and collaboration. Concept teams aren't allowed a bus ticket back to their hotel at the end of the first night without approval from the Build team. "The Build team needs to create five, shiny new prototypes by morning," says Pollard. With the help of coaches, prototype pitches are practiced throughout the night and well into the second day. The crest of the CHILL event occurs late afternoon of day two, where Concept teams hit the stage, still under the mass of glowing lanterns. Innovation at it's most creative, most pressurized form is presented to the CHILL constituency. CHILL'S culmination occurs as teams pitch to the investment panel for funding. Pathways for funding include building startups from scratch or creating joint projects. It's here where teams stand in front of Cisco executives as well as executives from their own companies. "CHILL is very structured in an un-structured way," says Intel's Vice President of Global Supply Management Jackie Sturm, "Everyone is open to the possibilities that we can solve for our businesses. My team is incredibly smart, we have a person in IT, a commodities trader, a manufacturer." "I'm very excited for the end result," adds Vice President of Customs at Schenker of Canada Limited, "CHILL is an opportunity to recreate and create value for supply chain. We're all coming together as a group—to find a common solution to a problem is very rewarding." Beyond innovation and the creation of new industry-breaking solutions, CHILL represents what can happen when peers from across fields come together to collaborate. Co-innovation will truly be the future of work, and CHILL can be the winning prototype for everyone looking forward.